Photographer unknown at this time Its March 19th 1960 at Cambridge as D5094 keeps company with Brush Type 2 D5535. The Class 24 is not too long out of Darlington Works, the paintwork still has that shiny freshness to it. The locomotive carries the smaller fuel tank, but retains the original water tank. The sixteen year nine month career of D5094/24094 saw allocations to Eastern Region and Scottish Region depots. March 1961 to Stratford (30A). August 1966 to Haymarket (64B) on loan, made permanent October 1966. August 1975 to serviceable store (at Haymarket & Carstairs). December 18th 1975 - reinstated to Haymarket. September 17th 1976 - stored unserviceable (collision damage?). December 1st 1976 withdrawn from Haymarket. After being placed in unserviceable store 24094 was stored at Haymarket from September 1976 until January 1977, when it was moved to Millerhill yard. It remained here until June 12th 1977 when it began its journey to Doncaster Works, reaching there on June 15th 1977, and was broken up there during September 1977. Movement: 24069/94, 24120/30 Millerhill - Doncaster w/e June 18th 1977. Noted Stratford Works April 1960. Noted Stratford Works December 1961. 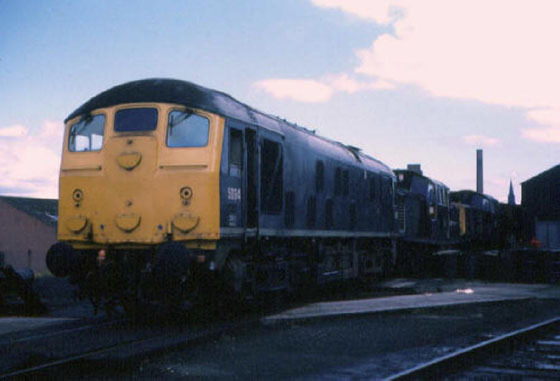 Darlington would become the third BR Workshops alongside Derby & Crewe to produce a quantity of the Class 24 locomotives, once these were completed it would then turn out a batch of the slightly more powerful Class 25 locomotives. 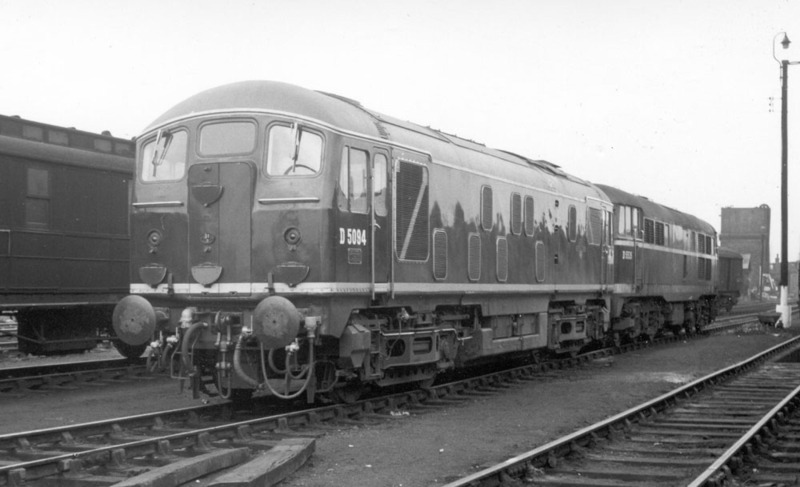 During April 1959 Darlington completed a batch of Class 08 shunters ending with D3705, with this order out of the way resources were now allocated to the construction of twenty Type 2s (D5094 - D5113), the first two would be destined for the Eastern Region (GE), the remainder going to Gateshead. These Type 2s would be mired in a trade dispute, considerably delaying their construction. 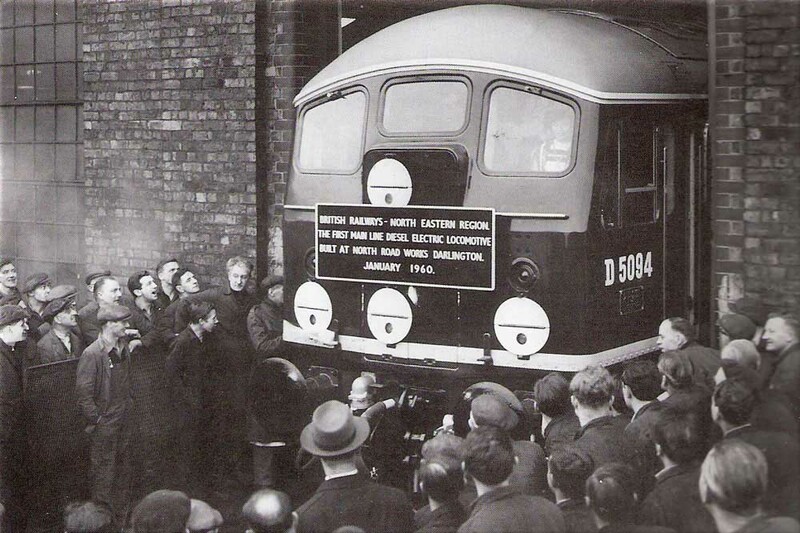 Darlington’s first main line diesel D5094 was ceremoniously driven out of the Works on January 12th. 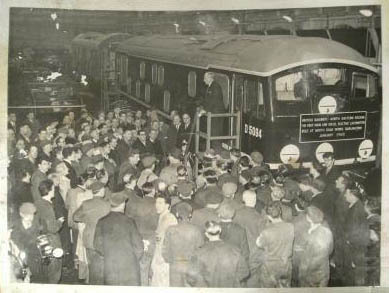 Trials, using empty coaching stock took place between Darlington & Newcastle, using both the main & coast line. Delivery to the Eastern Region was delayed until February 18th whilst minor adjustments were made. 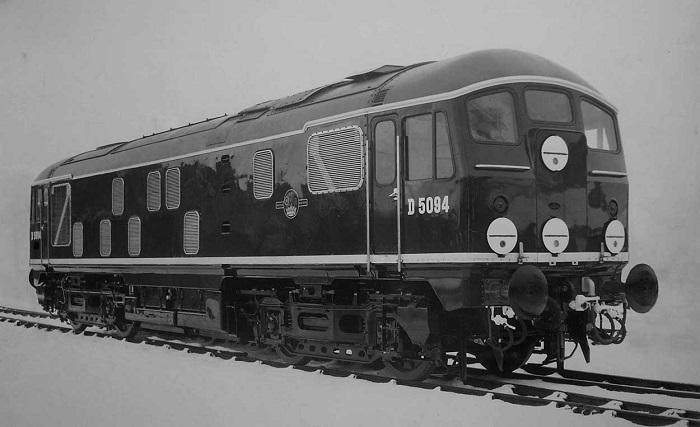 During February 1960 D5094 & D5095 were allocated to March (31B). D5094 was noted at Stratford during April 1960. Photograph courtesy Robert Kelly. 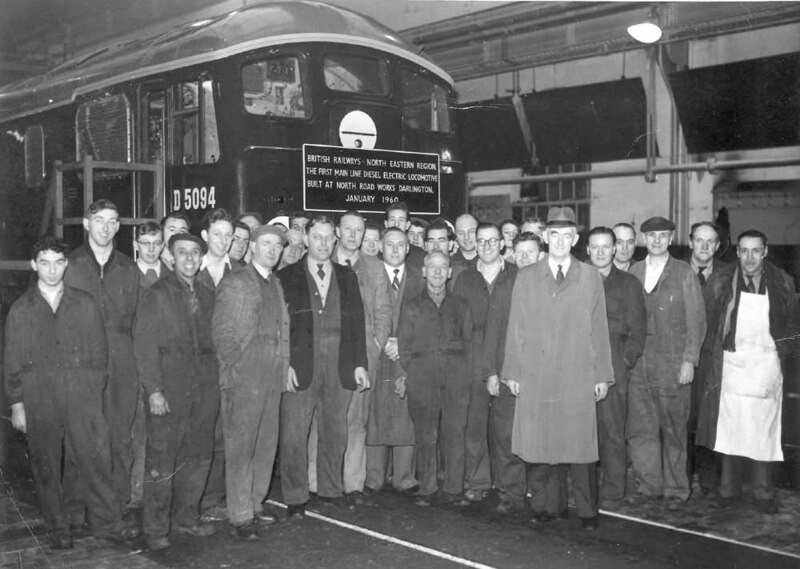 A fascinating view of Darlington's first mainline diesel electric locomotive D5094 and the men who worked on the production line that built D5094. The photographer was one of this team. Does anybody recognise any of these gentlemen? The first person on the right with the white apron is a H V Geldart,(Bert) carpenter & cabinet maker. Photograph courtesy Gordon Dolby. Another view of the almost complete D5094 as it is brought out into the yard for further inspection by the workers at Darlington Works. At this point in time the locomotive has no windscreen wipers. Photograph collection of webmaster. A publicity view of just outshopped D5094 in the snow at Darlington Works early in 1960. Interestingly the piping on the far bogie has been picked out in white whilst the nearer bogies remains in black. The SR Civil Engineer had recently permitted the use of the BR/Sulzer Type 2s over Blackfriars Bridge & Coldharbour Lane Bridge, this would allow use of these machines on cross London freights from Finsbury Park, replacing the J50’s. D5094 had visited Hither Green & Feltham whilst on loan to Finsbury Park from March. D5094 was noted on the Brentford loop on November 11th with a freight from the Great Northern headed for Feltham. D5094 was transferred to Stratford (30A) during March, then moved almost immediately to Finsbury Park (34G). It was noted at Stratford Works during December. On October 23rd the 4.55pm Newcastle - Kings Cross saw its locomotive, D279 encounter mechanical problems coming to a complete stop at Holme. Here D5059 & D5094 were removed from a freight and triple headed the train into Kings Cross, running some ninety minutes late. D5094 was noted at Doncaster Works during May. During July D5094 was noted at Derby Works. In this same month it was transferred to Haymarket along with many others from Finsbury Park, initially on loan but then made permanent during October. 5094 visited Glasgow Works during May & June. Photograph courtesy Ian Whalmsley An undated view of 5094 at Haymarket with Claytons 8586 & 8606 behind. The two Claytons were withdrawn in 1971 so presumably the photograph is from 1970/71. Although still in green the Class 24 has had the cab gangway doors sheeted over, and the center discs centered as a mark of its visit to Glasgow Works. Was this carried out during its visit to Glasgow Works during the spring of 1970? Condition October: green livery with full yellow cab fronts, faded grey roof, frame level stripe present, gangway doors sheeted over, headcode discs centered on cab front, shortened fuel tank, full size water tank, three rung bogie mounted footsteps, ridge sided sandboxes, blanking plates fitted, hand/footholds sheeted over, bodyside valencing removed. Light duty on August 27th for 5065 & 5094 was one BG on the Edinburgh – Carstairs portion of the Up West Coast Postal. TOPS renumbering took place during April. During July 24094 was noted with a fresh coat of paint - a recent visit to Glasgow Works? A shortage of Type 4s on the Edinburgh - Aberdeen services saw the 10.25 Edinburgh - Aberdeen hauled by 26022 & 24069 on February 26th and 24069 & 24094 on March 3rd. 24094 was stored during August at Haymarket, later being moved to Carstairs at least by October. It returned to Haymarket to be reinstated in December. The 17.10 Edinburgh – Berwick continued to run with a wide variety of power, December 29th 1975 featured 24121, 27109 on January 5th 1976, 27117 (6th), 27112 (10th), 24094 on January 12th, 55002 (13th), 47461 (14th), stored (?) 24069 (19th). 24094 powered May 7th’s 17.10 Edinburgh – Berwick service. On September 7th 24094 was noted passing Eastfield with a freight. 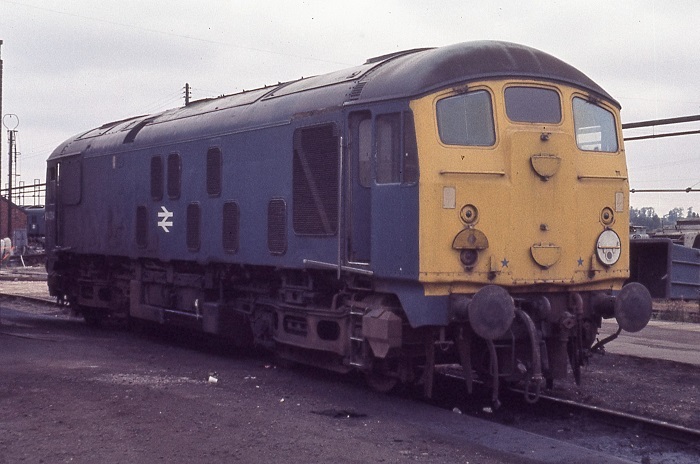 24094 was stored (unserviceable) a second time at Haymarket during September 1976, reportedly with collision damage. Official withdrawal took place on December 1st. Condition Final: blue/yellow livery, gangway doors sheeted over, headcode discs centered on cab front, shortened fuel tank, full size water tank, blanking plates fitted, hand/footholds plated over, modified battery isolating switch cover - hinged flaps replaced by three circular access covers. By January 24094 had been moved from Haymarket depot to Millerhill for further storage. During June 1977 24069/94, 24120/30 were moved as the Millerhill - Doncaster Works dead engine movement. They were noted at Tyne Yard on June 12th and at Doncaster on June 15th. Yet another gloomy, overcast day greets our visit to Doncaster Works on August 7th 1977. 24094 must have recently been moved up from Doncaster depot, little has been done to the locomotive, although as usual the windscreen wipers are missing. By September 1977 Doncaster Works had scrapped 24094. Unfortunately a scarcity of funds prevented successful bidding on the smaller picture. One wonders what other gems are tucked away in attics and garages, and how many have perhaps inadvertently gone to the rubbish heap. Page added October 9th 2007. Last updated March 12th 2019.